This entry was posted in news production and sales and tagged MINI Hardtop 4 Door Plant Oxford on September 9, 2014 by James Day. 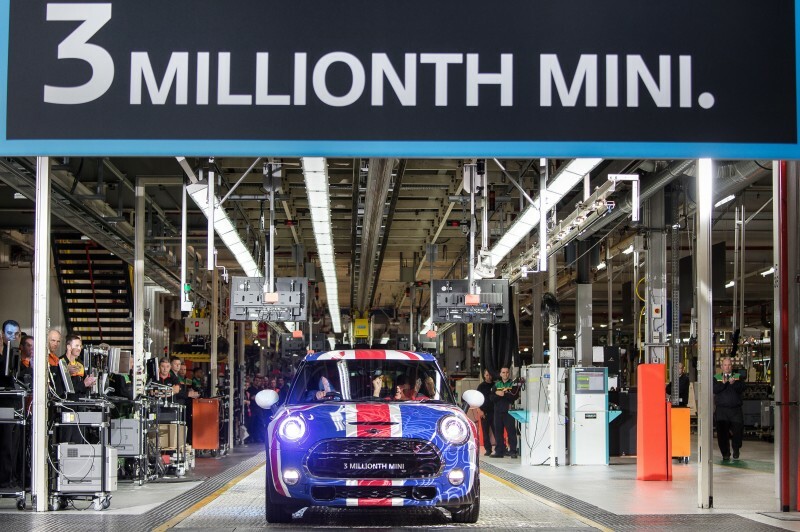 MINI announced today that it produced the 3 Millionth MINI. The milestone MINI is a 2015 MINI Cooper S Hardtop 5 Door with special Union Jack graphics. Watch the video of the MINI coming off the production line at the Oxford Mail. Oxford/Munich. Thirteen years after the brand re-launch in 2001, MINI has reached an impressive milestone today, as the three-millionth MINI rolled off the assembly line at the Oxford plant in the UK. Two million MINIs have been exported from the UK to more than 110 countries over the same period. Harald Krüger, member of the Board of Management of BMW AG, responsible for Production, and Peter Schwarzenbauer, member of the Board of Management of BMW AG, responsible for MINI, BMW Motorrad, Rolls-Royce and Aftersales, joined Baroness Susan Kramer, British Minister of State for Transport, and Frank Bachmann, managing director of Plants Oxford and Swindon, to celebrate the special-anniversary vehicle as part of an official ceremony. The car is a MINI 5 Door sporting the UK’s Union Jack. Plant Oxford currently produces the MINI, MINI 5-door, MINI Convertible, MINI Roadster and MINI Coupé models. The success of the MINI brand can be seen in the positive developments at Plant Oxford since 2001. Back then, a single shift of around 2,400 employees produced about 300 cars a day. Today, the Oxford site employs around 4,000 people. Working three shifts, the plant produces around 1,000 MINI cars per day. The UK is the MINI brand’s second-largest market worldwide after the US. The UK is also the fourth-largest market for the BMW Group. 80 per cent of the MINIs made in Oxford are exported, making MINI the third-largest vehicle exporter in the UK. “The MINI brand has had strong ties to the UK for decades. Our MINI production in Oxford represents a commitment to the brand’s identity, firmly in line with our successful strategy of “production follows the market”. Oxford is the centre of our British MINI production network, with the Swindon pressings plant and the Hams Hall engine plant near Birmingham,” stated Board of Management member for Production Harald Krüger at the event celebrating the production milestone. 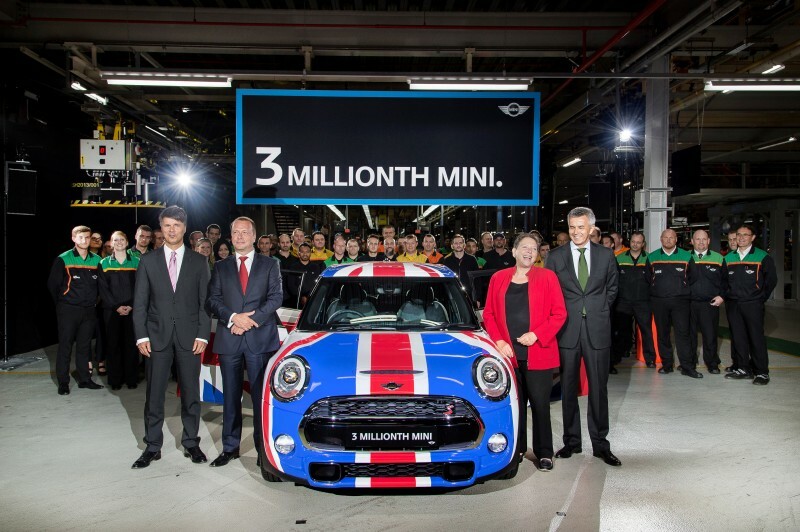 “Today, we mark two important milestones for MINI. Three million MINIs produced, and two million MINIs exported from Oxford to customers worldwide. These are impressive figures and definitely a reason to celebrate. In markets big and small, MINI has always appealed to customers on an emotional level,” said Board of Management member Peter Schwarzenbauer. The BMW Group has invested a total of around £1.75 billion in its British plants since 2000. Between 2012 and 2015 alone, the BMW Group is investing a total of £750 million in its MINI UK production network. This investment is part of the international growth strategy for the MINI brand and secures the long-term future of the Oxford plant and safeguard 5,600 jobs at the Oxford, Swindon and Hams Hall plants. The BMW Group produced a total of 303,177 MINI-brand vehicles in 2013. The production volume at MINI Oxford reached 175,986 units. A further 125,559 units of the MINI Countryman and MINI Paceman were contract-manufactured at MSF Graz in Austria and other assembly plants in Asia. The BMW Group further expanded its production capacities as the next major step in the implementation of its global growth strategy. With the significant growth of the MINI brand, the BMW Group requires additional external production capacity beyond that of MINI Plant Oxford. Sharing production of the MINI Hatch with contract manufacturer VDL Nedcar (Born, Netherlands) since July 2014 will give the BMW Group global production network greater flexibility for other models. The British production network will nevertheless remain the heart of MINI production. Read the press release: Double reason to celebrate: two milestones for MINI in Oxford.